The soldiers were going out of the city with Jesus. The soldiers forced another man there to carry the cross for Jesus. This man's name was Simon from Cyrene. They came to the place called Golgotha. (Golgotha means "The Place of the Skull.") At Golgotha, the soldiers gave Jesus wine to drink. This wine was mixed with gall. Jesus tasted the wine but refused to drink it. Forced to carry his cross! Simon was forced to carry Jesus' cross. But what about us? 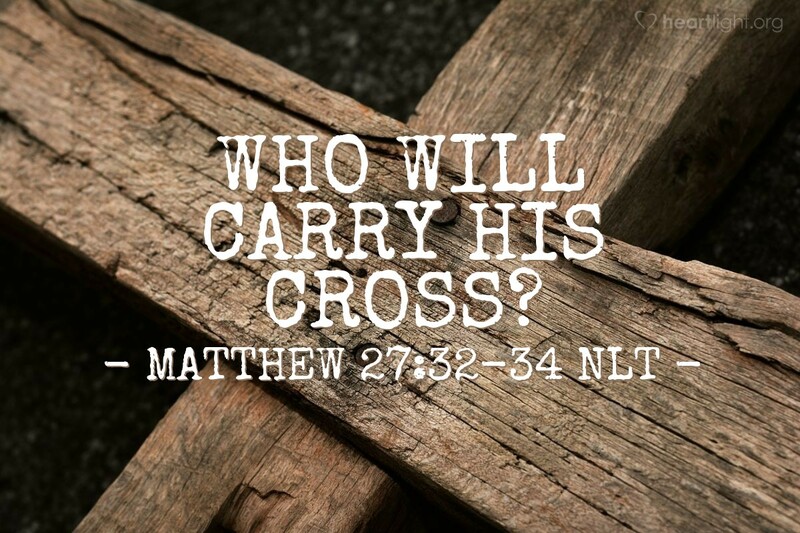 Are we forced to carry Jesus' cross? Is it something we have to do? Didn't Jesus say, "Unless you take up your cross and follow me you cannot be my disciple"? I don't know about you, but I don't feel forced to carry Jesus' cross. It is an honor. Yes, sometimes it is difficult to be his disciple. Yes, sometimes it is hard to carry his cross when those around me don't believe and belittle my faith. Yes, sometimes it would be easier if I didn't hear his call in my heart. But when I think of all that he went through for me, when I think that it was on the cross that he suffered for my sins, when I realize that he felt the blows from the rod and the sting of the thorns and the indignity of his mocking so that my sin and my shame could be banished, then it is an honor to be identified with his cross. So whether it's dying with Christ in baptism, or dying to my flesh each day, or it's putting to death the misdeeds in my body, I gladly take up his cross and follow him. O Father, I feel compelled to carry Jesus' cross, but it is not because someone makes me. Father, for all that you have done, for all that Jesus paid, I thank you. And today, I will pick up the cross and seek in word, thought and deed to honor Jesus as my Lord. In the name of my Savior I offer my thanks and praise. Amen.